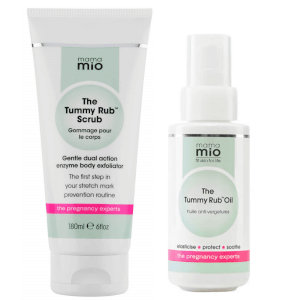 Mama Mio's Stretch Mark Minimising Duo (Scrub + Minimising Cream) has been carefully curated to help protect skin during the nine month stretch. 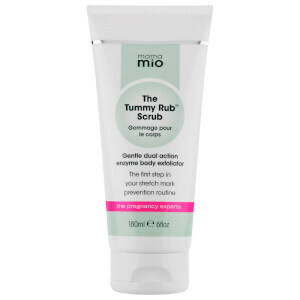 The full-sized products work in synergy to nourish and soothe skin while minimising the appearance of stretch marks. A potent cream that works to reduce the appearance of old and new stretch marks caused by pregnancy and weight fluctuations. Utilising a cocktail of powerful peptides, fruit extracts and nourishing oils, the powerful formula helps to visibly improve the look of stretch marks and skin pigmentation. Delivering maximum results, it contains Sepicalm™ VG, a plant-derived skin lightening active to help fade marks, Matrixyl 3000 to promote collagen production and skin repair, and Sweet Almond Oil for its anti-itch properties. Safe during pregnancy and nursing, it's the perfect solution to help keep your skin looking its best during times of change.